Not long ago, the British retail banking sector was dominated by just a few big brands. That is undeniably starting to change, and yet our research shows that people may say they have a fairly low opinion of the traditional players, but there is also a strong preference for the devil they know. According to a recent YouGov report, only one in four people are willing to do business with a completely new bank brand, and 67 per cent say they prefer to purchase products and services from a well-known brand. These attitudes make for a daunting environment for new banks. Take Metro Bank, which in 2010 became the first new high street bank to be created in Britain in 150 years. Started by American tycoon Vernon Hill, it is hoping its fresh image and highly personal approach to customer service will enable it to break into the big leagues. But consumers have yet to fall in love with it. Metro has an overall Index score (a composite of six key image attributes) of 0.2, which is better than most of the big brands, but hardly a ringing endorsement. And just four per cent of consumers say they would consider opening an account there. This is not to say that Metro Bank does not have many of the early signs of success. It recently raised £400m to fund expansion plans that include taking its number of branches from 25 to 200 by 2020. But the tepid response from the public is illustrative of the challenges facing upstarts. 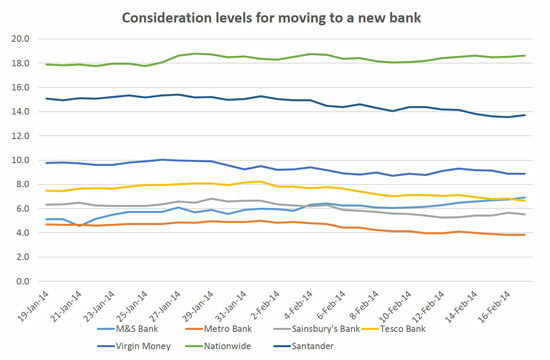 The challenger brands that are outdoing Metro Bank on consideration are those operating under an established umbrella brand, such as Virgin Money (nine per cent), M&S Bank (seven per cent), Tesco Bank (seven per cent) and Sainsbury’s Bank (six per cent). Nationwide and Santander lead the sector for consideration, at 19 per cent and 14 per cent. The takeaway point is that being the new kid on the block in British banking isn’t going to be easy.